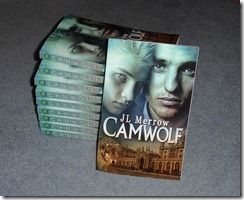 I’m a very happy author today, because the postman brought me a present – my author copies of Camwolf! The paperback edition of Camwolf is due out on 3rd April 2012, and is available to pre-order now on Amazon. I found this such an interesting and unusual werewolf story. I loved the way the book explores the two different ways the men react to their wolf sides and how much that affects their relationship…If you are looking for more than the usual werewolf story, I would definitely recommend it. – JayHJay, Joyfully Jay. 2 Responses to Camwolf has landed!